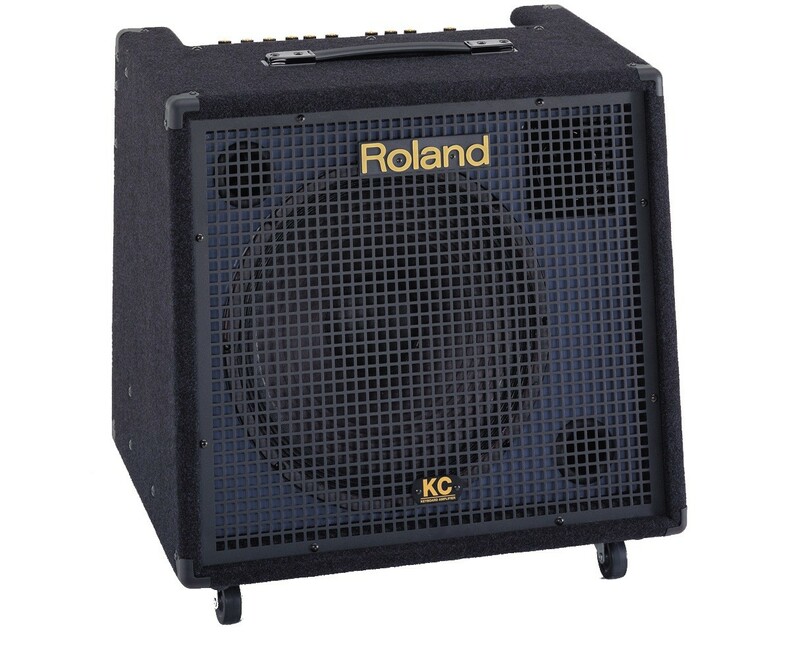 KC-550, Keyboard Amplifier from Roland in the KC series. Product replaced by the Roland KC-600. Sam Rossi's review"Sounds Like Just Home!" It doesn't get any better (at least not yet). The sound generated is as clean as you could imagine a sound being; no distortion and hardly any EQ really even needed to be done (depending on what you're playing). I'm running my Roland Fantom X8 through the KC550 and you can't do any better than Roland matched with Roland. 've tried many different approaches to getting the keyboard to sound out as good as I wanted and expected it to. It started with two Hartke KM100 amps running stereo from the keyboard. Sounded great, in fact I posted a review on them. However, after having them for just a short time I began to get a feeling that the great sound would not last in the long run due to certain very small but noticeable distortions starting to form. I'd heard time and time again that Hartke wasn't the best, so I made the move and returned them. I then tried running the keyboard through a PA system, using various speaker choices both powered and passive; needless to say it worked out (somewhat; more so for the passive, forget the actives - nothing but distortion) but the sound generated was nothing to brag about. I quickly returned the active speakers, and am now using the passives for vocal monitors. I had never tried a KC550 before now, and my reasons were because of playing a KC350 that was probably not EQ'ed (didn't care to check), and found the sound to be horrible. To buy a full on PA system that I know would have worked, the amount of money to be dropped into that would be outrageous and too much for just needing a keyboard monitor. I decided to play the KC550 and really mess around with it in the store; giving it a little more time than just a minute or two, made all the difference. I'm soon planning to buy a second KC550 to run stereo link, but even with just one its a beautiful sound. Granted, I've only owned mine for one day, so we'll see what the long run brings for this, but somehow I feel it'll all be just fine. Sounds like home. ericthegreat's review"great amp , must try"
I have this amp for a few months now, and I don't regret getting this one. It's sound is just amazing and it has enough power to get me heard over my band mates (they have a nag to play somewhat loud). I've ran a electric guitar trough it a few times, it sounds very clean and almost acoustic. 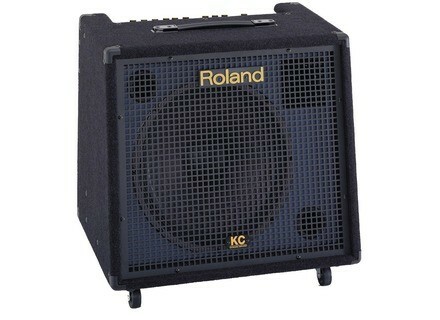 This amp is great for small to medium-large sized gigs, and has enough power to be heard over the guitars. It does need some tweaking when in larger areas. (I have to give the high-mid range a small boost for better sound.) The four (or five) inputs are good for me, I only use three at the moment. I like that the KC 550 has four (Stereo) inputs and an extra AUX input, making a total of five inputs. I use it as a monitor and mixer when we record our songs by ourself. The sound output, when all channels are mixed, is very good. A great plus to this amp. There are casters attached to this unit, which can be taken off. This is a good thing, since it's not that light (~27 kg) and somewhat bulky. The KC 550 has a Stereo Link ability; you can link it with an extra KC 550/350. Combined you can have ten inputs (eight without AUX), though on two different outputs. This unit features a three band EQ, which is all I need actually. This amp is a solid state setup. The power coming out of this thing is fairly strong at 180w. The connections are actually pretty sweet on this amp. This amp has a built in 4 channel mixer which offers stereo 1/4&quot; jacks for each channel and also an XLR input on channel 1 and finally an RCA input. The outputs include stereo 1/4&quot; and XLR connections and of course a headphone output. This amp was also designed to be part of a larger setup. You also have the input/output options to stereo link the amp with another KC model amp and also a Subwoofer too. As for settings, well, it has a three band EQ with a &quot;Shape&quot; button that kind makes the sound a little more punchy in my opinion. It also comes with a ground loop switch which can come in very handy when you get that awful humming sound. As for effects there are no built in options. I would say that the general config/setup is very simple. If you have ever used even the most basic mixer and the most basic combo amp, then you should be totally fine. If you zero all the knobs (12 o'clock) the sound is pretty decent. It only takes a little tweaking of the highs and lows for me to get the sound I like. I puchased my KC 550 used and didn't get the manual. However, I have never come across anything on this amp that would make me need it. I have had this amp for 1 1/2 years. What I like most? It has stereo connections for a single speaker. That comes in very handy when you want to use this amp as a PA speaker but only have one (good for DJs). I also like how light it is for its size. Its not a feather but its the same size as some other solid state amps I own but weighs a good 20 or so lbs. less. What I don't like? It could be my speaker is going bad, but I feel the amp cannot handle low end frequencies very well. It starts to make some bad distorted sounds on some of my &quot;bass&quot; keyboard patches. Overall, this is a pretty decent amp for someone who wants the power and the simple mixing options with out having to lug around a whole PA. If thats not you, spend your $600 on a nice powered PA speaker, and when you can spend that much again, get the other one for the pair. I also own a really nice set of EV powered PA speakers and they suit me much better. Infact, I might be selling my KC 550 just because I never use it any more. It's been 4 years since I have it, he saw the green and not ripe: it is used for outdoor concerts in addition to a small sound system peavey. Suffice to say that cash my piano (or I'm low to the left hand), my microphone and microphone bass drum ... It operates at the limits of its capabilities (when it's a little too loud sizzling sound, is corrected). Quality and reliability are always at the rendezvous despite these intensive utilistations (5 concerts a year outdoors). C'estsur is lacking a bit low for the outside, so this year we are going to add a subwoofer to help him. Everything is simple and clear. The equalizer can easily find a good quality sound. In addition there is a button "shape", the equivalent of a loudness, to improve the sound at low volume. Value for money very good. I strongly recommend it for those who want a powerful amp and punchy.En lighter and less powerful, the KC 350 is a very good choice too.